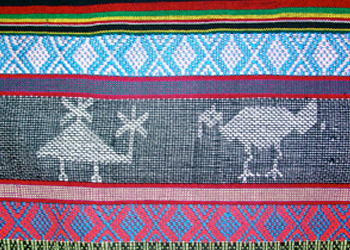 Thehill tribe weavers incorporate a wide variety of traditional animal, plant, mythical and ancestor worship patterns in their designs. 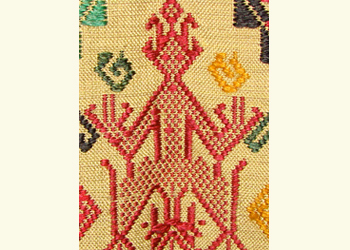 Many of the motifs are readily identifiable. However, in the shaman cloths, the motifs are not only "hidden" to the casual observer, but are also believed to be unrecognizable by spirits that may be causing illness or bad luck. The shaman can thus sneak the positive spirits needed for healing into a room on their clothing, and then, through ritual ceremony, unleash these hidden positive spirits of the cloth to dispel those spirits causing distress. 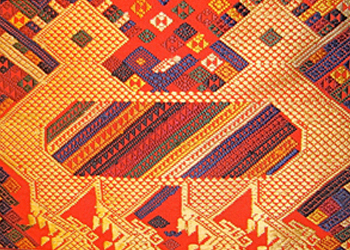 Also, shaman cloths are often used as the centerpiece of a wedding blanket, ensuring the couple protection from negative spirits. 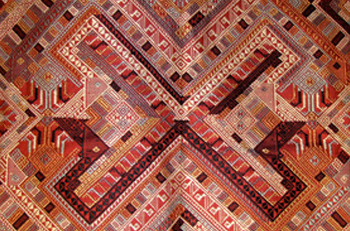 Large silk shaman cloth or ceremonial wedding blanket with naga designs. Siho (elephant lion) pregnant with naga (mythical river serpants) and with a trunk that turns into a pregnant naga. A design's interpretation may change with time and location, but the motifs essentially remain the same. 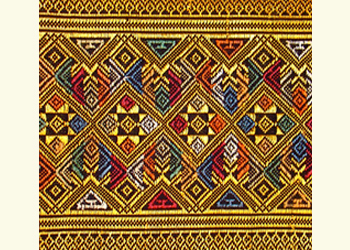 While motifs vary from culture to culture, we have found that authorities, whether textbook writers or village weavers, often differ on a motif's representation. 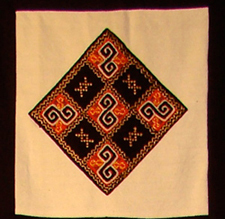 For example, one weaver's gourd seed motif is what another authority may designate a flower. 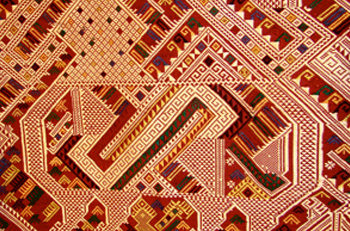 This is understandable in that the traditions that generate and guide these motifs not only most often come from centuries past, but also from a wide variety of very different ethnic groups. As Patricia Cheesman (see recommended books) indicates, a design's interpretation may change with time and location, but the motifs essentially remain the same. Regardless, what matters is what is in the heart of the individual designer and weaver, and in the imagination of those who use and enjoy the art. 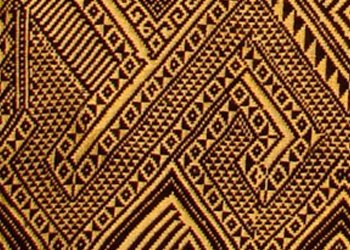 Many items on the following list of motifs may designate an earthly or spiritual design. 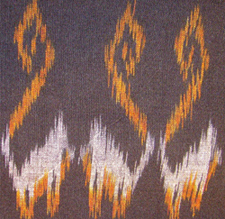 For example, a snake motif may represent either a land snake, or a mythical river serpent. Some of these motifs date back over 1000 years and can be found in the ancient poetry of courtship, proverbs, or oral literature; other motifs have been introduced recently, as with wartime icons. 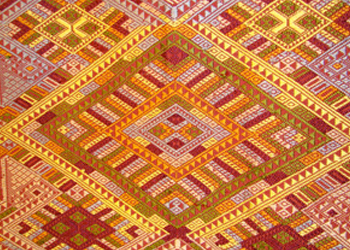 Weaving is an active and creative art, and by no means a staid reproduction of ancestors' ways. Ancestor Spirits: A symbol of protection for a journey in one's current life or in the afterlife. Ancestor spirit with small naga above his hands. Ancestor spirit in a spirit boat with a temple-shaped roof and naga-headed candelabra. 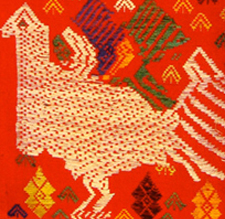 Eagles (Huong): This fearsome bird, often on children's clothes, protect babies from bad spirits. Elephant lions (Siho) and Elephant-birds: A symbol of invincible strength and political power. Siho (mythical elephant-lion) with ancestor spirit on its back, a hong bird standing on its tail, and flowers. Two-headed crested siho with a rainbow belly, hong bird on its back, and flowers. 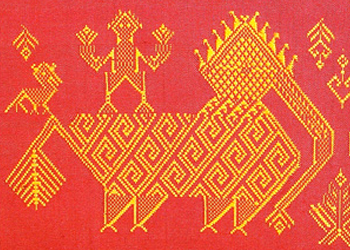 Flying horses: In Lao literature, these often performed essential tasks for military heroes. Frog-person: Ancient tradition associates frog-people with essential monsoon rains. Giant-Spirit: A terrifying protector who stands guard in doorways (often used in door curtains). Gibbon-person: An ancient story tells of a mother gibbon bringing food to starving children. Hong birds: Stylized birds that some references say are male spirits, but, when flying, are mythical swans that represent socially privileged women. 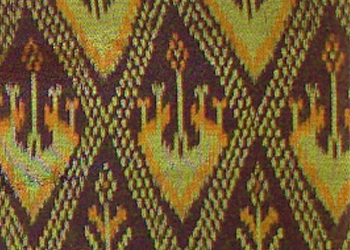 Hong birds (supplemental weft design). Flying hong birds (mat-mi design). Horse-deer: Another animal from myth that represents strength. River serpent (Naga or Ngueak): A most popular motif, these serpents offer protection. Some say they represent the female spirit. Other mythology talks of naga taking human form, both male and female, and marrying humans. These serpents are protectors of the home, and, as they live in the rivers, are connected to the water needed to sustain the rice harvest. Two-headed naga with both heads in the triangle shape, one with a diamond-shaped peach-colored eye and white and gold crest, and one head with a small white eye. Birds: Representative of a weaver's free spirit and the letting go of emotional frustrations. Butterflies: Used only for items worn by young girls, as they are signs of beauty, but not long lasting. Butterflies would never be woven into any wedding textiles. Deer: A traditional protein source. The horns, skulls, and skin are used for many shaman items, including staves and drums. Elephants: Animals that played an important role in military expeditions and therefore represent power, both military and political. Frogs: Creatures of rain and fertility ("frog" in Lao – khop - is slang for female sexual organs). Horses: Like the elephant, horses were critical for military might. Silkworms: The source of silk, used in almost all Lao religious and ceremonial textiles, as well as a source of protein. Snails: A common protein source. Water buffalo: An important domesticated animal, used to plow rice fields and as food. 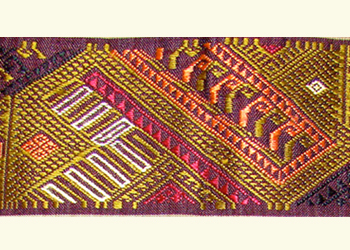 Hmong embroidery with s-shaped snail design. Bamboo: An essential plant for home building and a thousand other projects. 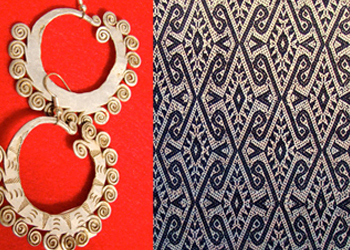 Fern pattern in two media: on the edges of Hmong earrings, and in a Lao-Tai blanket. 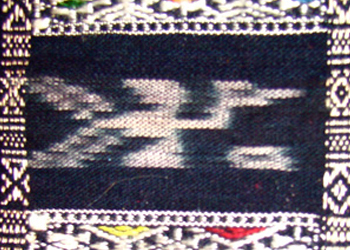 Flower and star pattern in skirt border. Gourd seeds: One myth has human beings being originally born from the gourd. Rattan: An essential plant for basket weavers, and also used as a food. Trees: Symbol is often used in ritualistic healing cloths, and represents the "tree of life." 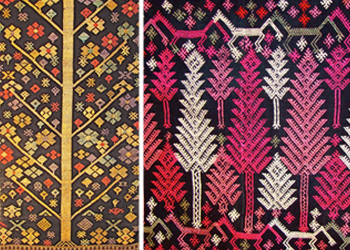 Trees in two media: Left is woven in supplemental weft design in Laos, and right, embroidered with deer on a Yao wedding apron. (see the second siho photo). Boats: Shaman are said to travel to other worlds on flying spirit boats (see the second ancestor figure above, standing in a spirit boat). Candelabrum: Often depicted lighting the way for a spirit boat (see the second ancestor figure above with naga-candelabra). House gable: A very common motif representing the home. Lantern: Like the candelabrum, this diamond-shaped motif "lights the way." Stupas (Buddhist temples): Shamanism and Buddhism are often entertwined in Lao culture. Writing characters: Both locally-used and English letters can be found used as motifs. 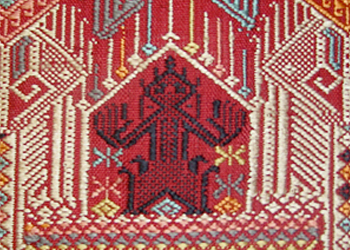 *These motifs were created during recent wartime (1954-75). 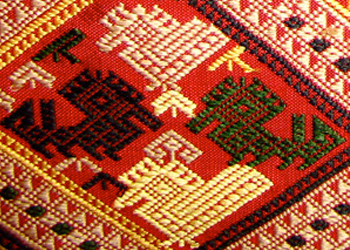 Helicopter next to traditional turkey pattern (hand-picked as a supplemental warp pattern) from a heavily bombed area of Laos. Lantern pattern made of flowers and rainbows (which represent the belly of the naga).